How bright a star appears in the sky depends on many quantities: the star’s colour, temperature, size, distance, and more. Hotter stars pump out more light, but a small, hot star might not be very bright (are there any white dwarfs visible to the naked eye?) Unless it’s nearby. 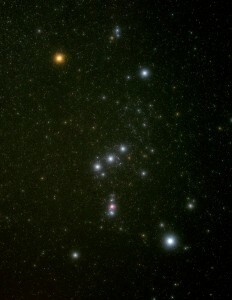 Cooler stars don’t shine much but a gigantic, cool star can be very bright, like Betelgeuse, the bright, red star that marks Orion’s shoulder. Unless it’s very distant. Untangling the temperature, size, distance, brightness puzzle can be touch for astro 101 students. But its really important because only through untangling can we determine the actual amount of energy — how many joules per second — a star is emitting. That quantity, the luminosity, is critical for predicting the evolution, past, present and future, of the star. Star 1 and Star 2 have the same temperature. Star 2 appears brighter in the sky. How is this possible? Is Star 2 the same size and closer? Or the same distance but bigger? What about farther but much bigger – would those differences counteract each other? Oh, and how do you make this a multiple choice question? Translate each scenario into words, focusing on Star 1 or Star 2. The numbers in this list refer the numbered scenarios in the table. a) (yes) Star 2 is bigger than Star 1 and closer. b) (yes) Star 1 is smaller than Star 2 and farther. 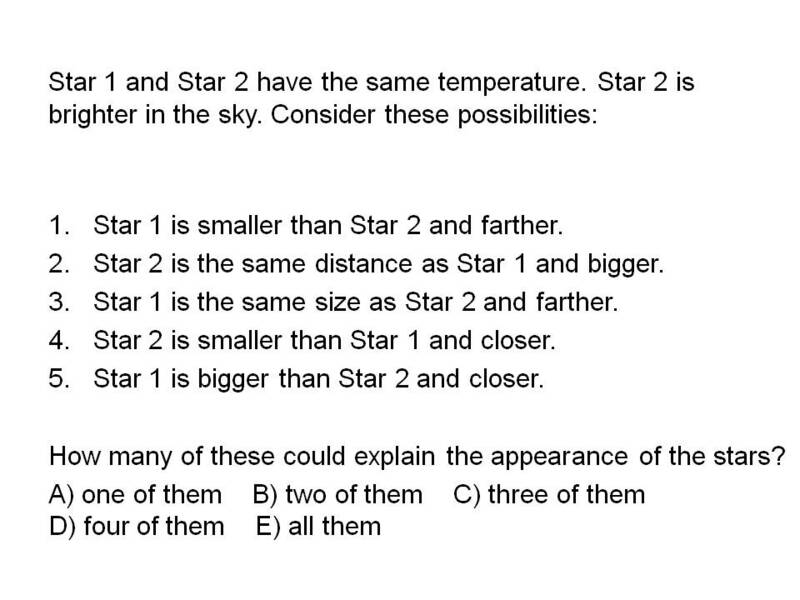 a) (yes) Star 2 is the same distance as Star 1 and bigger. b) (yes) Star 1 is the same distance as Star 2 and smaller. a) (maybe) Star 2 is bigger than Star 1 and farther. b) (maybe) Star 1 is smaller than Star 2 and closer. a) (yes) Star 2 is the same size as Star 1 and closer. b) (yes) Star 1 is the same size as Star 2 and farther. a) (no) Star 1 is the same size as Star 2 and the same distance. b) (no) Star 2 is the same size as Star 1 and the same distance. a) (no) Star 2 is the same size as Star 1 and farther. b) (no) Star 1 is the same size as Star 2 and closer. a) (maybe) Star 2 is smaller than Star 1 and closer. b) (maybe) Star 1 is bigger than Star 2 and farther. a) (no) Star 2 is the same distance as Star 1 and smaller. b) (no) Star 1 is the same distance as Star 2 and bigger. a) (no) Star 2 is smaller than Star 1 and farther. b) (no) Star 1 is bigger than Star 2 and closer. Clicker question about stars' brightness, distance and size. Here was our plan. It’s all about the ambiguous “maybe” scenario 4. If a majority of the class chooses the correct answer “D) four are possible”, we’ll respond with, “Great! Which one isn’t?” And if many students choose “C) three are possible”, we’ll counter with some pairing and sharing. Here’s how many students voted for each choice in the first (“think”) vote. How many scenarios? Almost every agrees that 3 or 4 of these are possible. Is there one that’s definitely impossible? Great. So which is the other one that might be wrong? [Full disclosure: no one answered until we further prompted with] What about Number 4? A student at the back of the room (doubly-excellent!) said, “Well in Number 4, it depends how much smaller and how much closer…” Yes, Yes, YES! Exactly! Ahhh, golden. There, that’s my clicker story for today. Thanks for hanging in to the end. This posting is really a chance for me to record how we made up the question and how we planned our responses. I can easily imagine applying this approach to other phenomenon that depend on 2 variables. Maybe you can, too. This entry was posted in astro 101, clickers and tagged clickers, stars, think-pair-share. Bookmark the permalink.